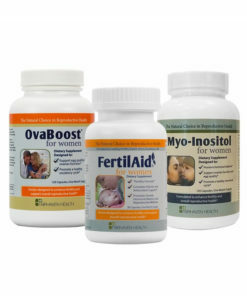 Includes two powerful dietary supplements, FertileDetox and OvaBoost, to help you reduce the damaging impact that environmental toxins, specifically endocrine disrupters, have on your fertility and your baby. Everyday chemicals, specifically endocrine disrupters, are the new tobacco. Evidence from research makes it clear that the toxic chemicals used around us need to come with warnings. Unfortunately, we are left to researching labels on our own and avoiding what we can. 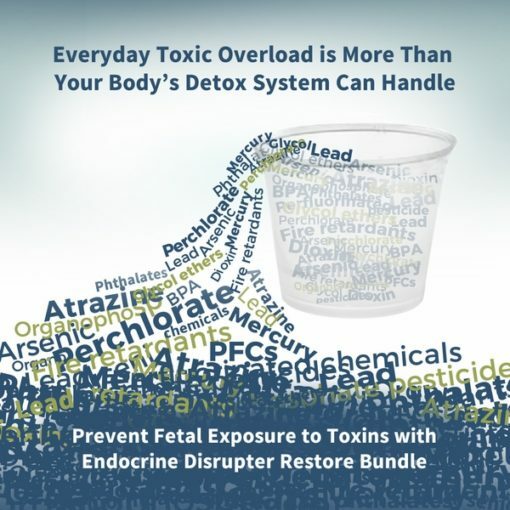 Avoidance of endocrine disrupting chemicals can be particularly problematic in workplaces, airplanes, and public places like salons and malls. 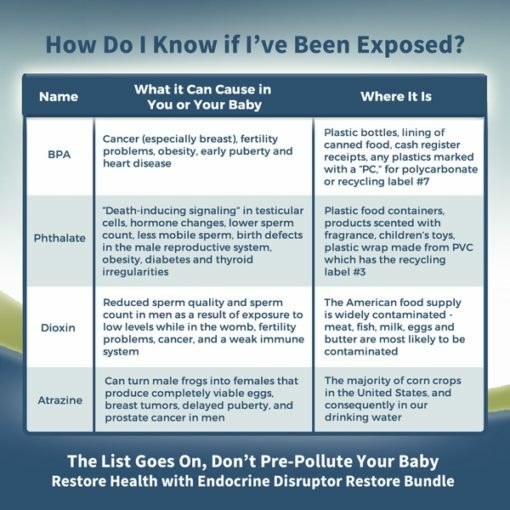 The impact of endocrine disrupting chemicals is two fold. First, these toxins can make it more difficult for sperm to fertilize the egg and for successful implantation following fertilization to occur. Second, endocrine disrupting chemicals increase the chances of chromosomal abnormalities and birth defects. This can lead to a higher chance of miscarriage or health problems for a newborn. 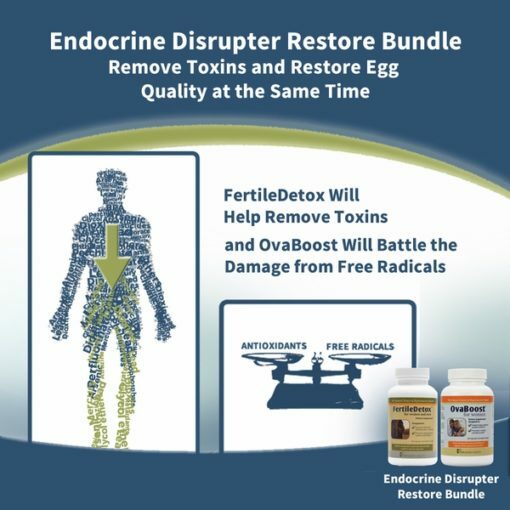 The Endocrine Disrupter Restore Bundle includes two powerful dietary supplements, FertileDetox and OvaBoost, to help you reduce the damaging impact that environmental toxins, specifically endocrine disrupters, have on your fertility and your baby. The best defense is a good offense! Why Do I Need the Endocrine Disrupter Restore Bundle? 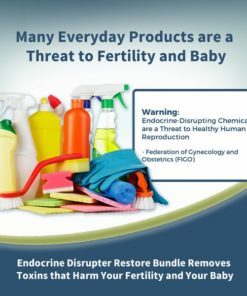 What Exactly are EDCs (Endocrine-Disrupting Chemicals)? Endocrine disrupters are chemicals that mimic, or interfere with, the function of natural hormones like estrogen. 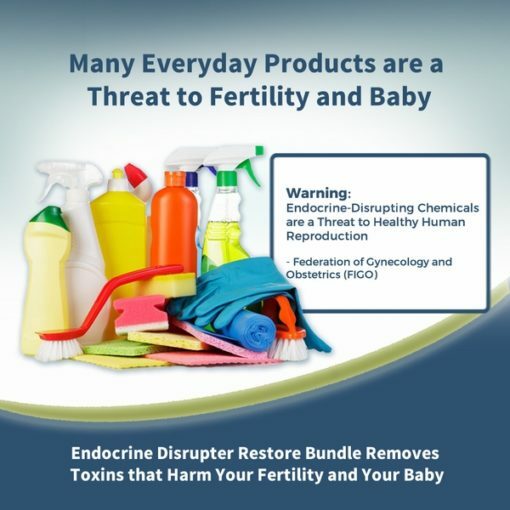 Endocrine disrupters are found everywhere – in pesticides, plastics (like your water bottle), cash register receipts, shampoos, cosmetics, and food packaging. 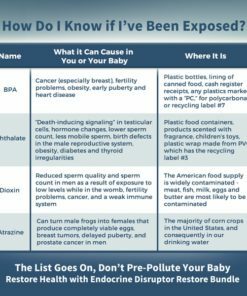 When you hear the words BPA, paraben, and phthalate, think endocrine disrupter. 6. Say no to cash register receipts – a surprising source of BPA, right? 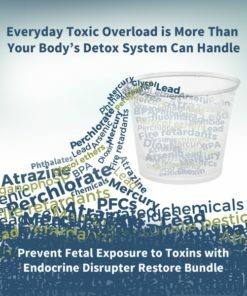 Even with extreme diligence and vigilance, it is impossible to avoid all endocrine-disrupting chemicals. Lucky for us, the human body is amazing, and has several mechanisms for removing harmful chemicals. Your skin, your digestive system and your liver are basically detoxification machines. However, with daily exposure to chemicals, our detoxification systems become overworked and inefficient. 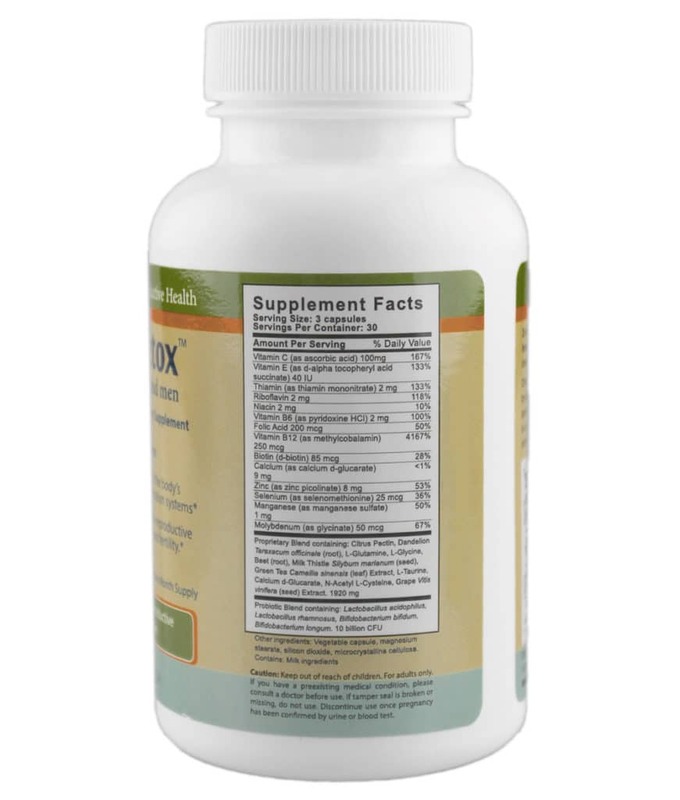 FertileDetox contains herbs and nutrients that naturally support the body’s detoxification systems, so that toxins are eliminated from your body before they cause damage. When toxins enter the body, free radicals (unstable compounds) are produced, which can create a condition known as oxidative stress. Oxidative stress causes damage to cells throughout the body – including egg cells. 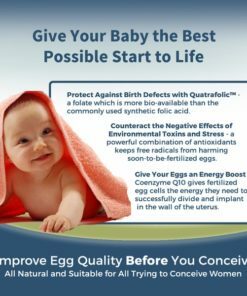 OvaBoost offers a combination of antioxidant nutrients that help to prevent oxidative stress, thereby promoting egg quality. Please consult with your physician before taking OvaBoost if you have been prescribed a medication for depression or anxiety, or if you are taking the herb St. John’s Wort, as large amounts of myo-inositol may have additive effects when taken along with drugs and herbs classified as selective serotonin reuptake inhibitors(SSRI) and selective serotonin norepinephrine reuptake inhibitors (SNRI). 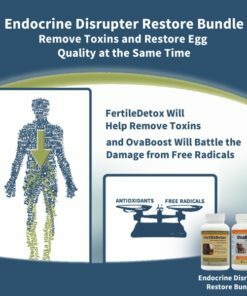 Helps remove toxins from your body before they can damage your eggs. 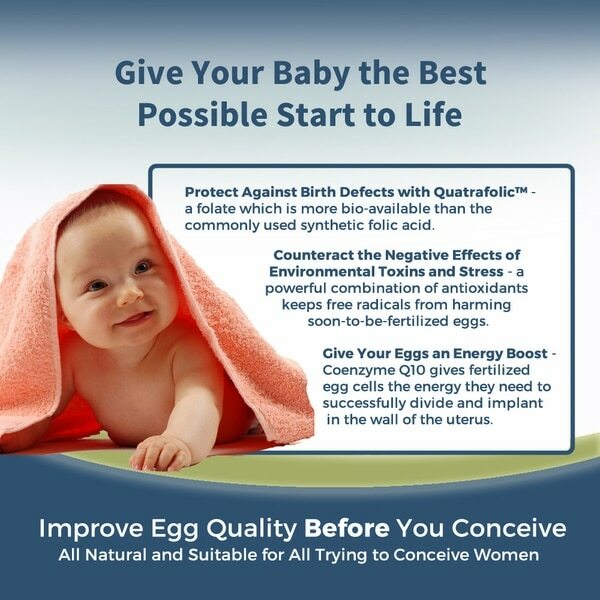 Restores egg cells to health giving your baby the best start to life. 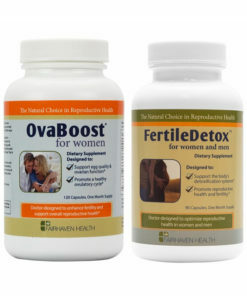 Bundle includes OvaBoost and FertileDetox, a cost-effective way to minimize the damaging effects of toxic chemicals on your fertility and your baby. All Natural! Works with your body’s own systems to remove toxins and restore egg cell health. What is the daily dosage ? Each bottle is a one month supply. 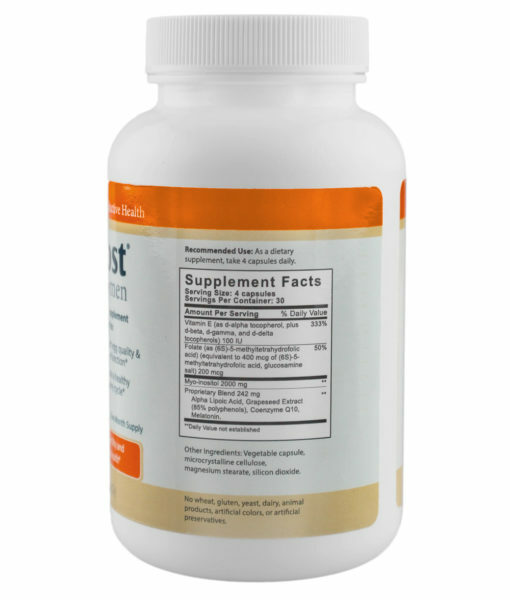 OvaBoost is a 4 capsule per day dosage. 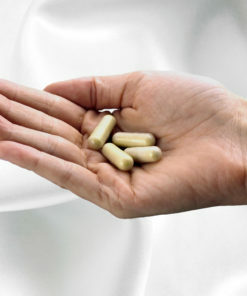 FertileDetox is a 3 capsule per day dosage. We recommend that you split up the daily dosage throughout your day with meals. 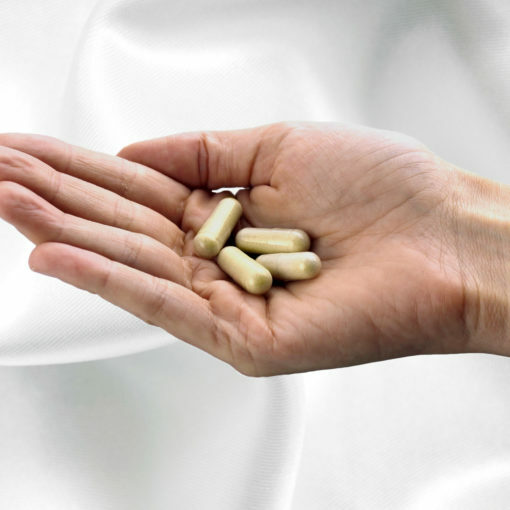 To complete a detox, you will want to take FertileDetox consistently for 3 months. 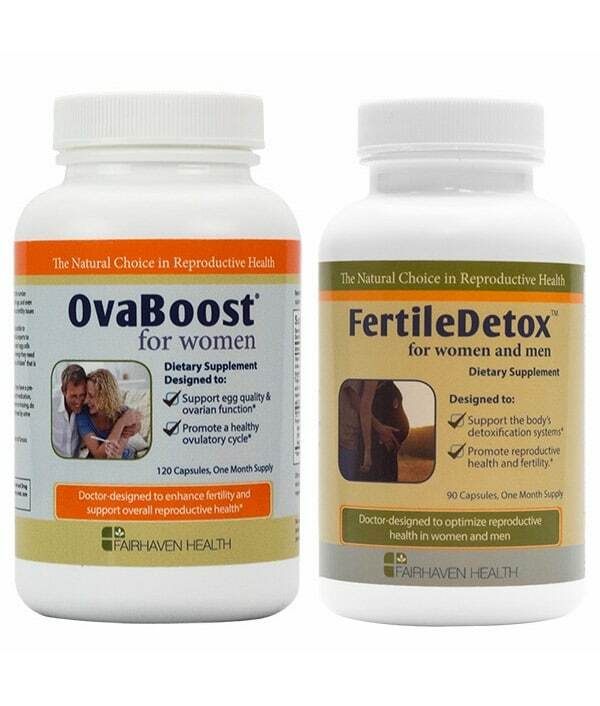 We recommend use of OvaBoost until pregnancy is confirmed with either a blood or urine test. 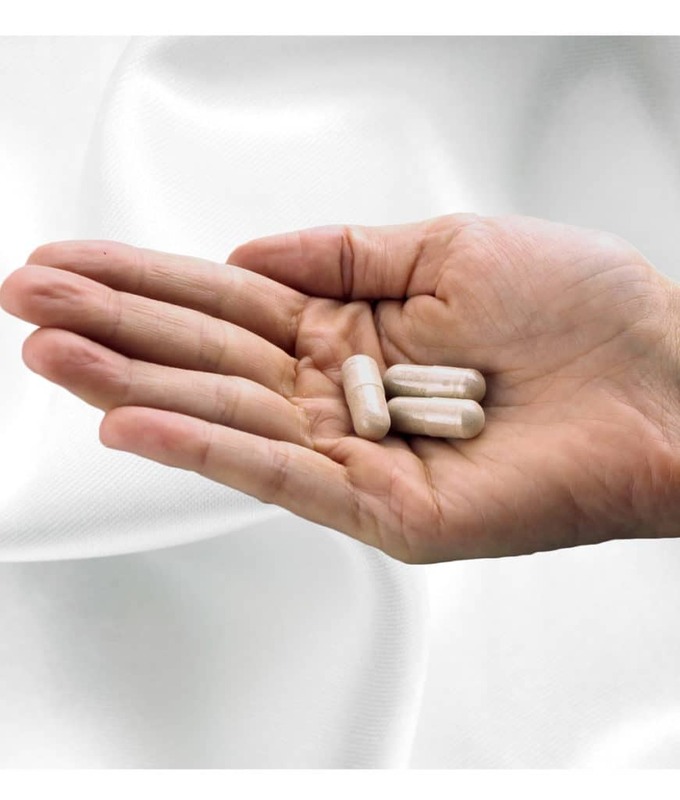 Can I take these supplements with my multivitamin or prenatal? 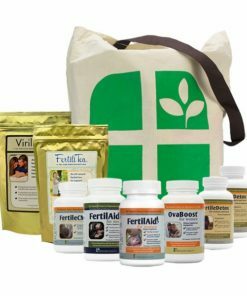 Yes, we recommend using the PeaPod Prenatal. 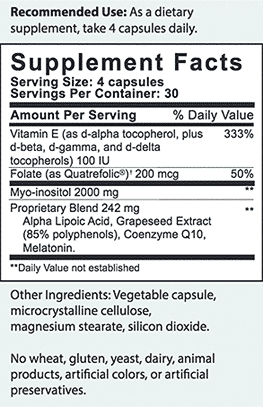 Prior to use with prescription medicine, please review the complete ingredients list with your prescribing physician. 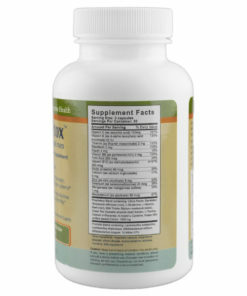 The ingredients list is provided on the product page of the website or on the bottle for your convenience. 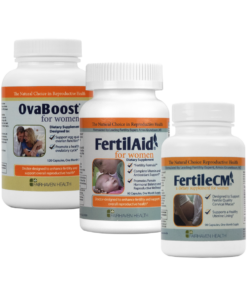 Please review the Women’s Fertility Supplement Guideline to verify which products can be used together. We are going through ART -IVF or IUI. 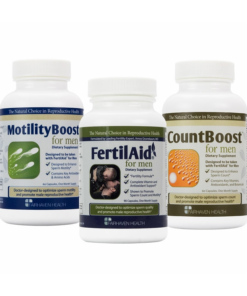 Should I use these supplements to optimize my reproductive health? 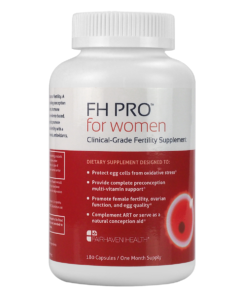 For women that are working with a fertility doctor, or undergoing ART procedures, we recommend that you consider use of FH PRO for Women. For more information about OvaBoost, please visit the product page. For more information about FertileDetox, please visit the product page. 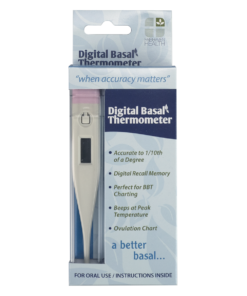 Read 1in10’s blog review of OvaBoost. I have noticed a difference after starting this bundle. My cycle has been less painful and I don’t have clotting like I did before taking this product. The first few days of taking these pills I felt tired, but that feeling went away. I will continue for 3 months and decide to if I want to continue. Have regulated my cycle since having 18 month ton28 day cycle again.My cycles before taking this have been irregular due to hormonal imbalance with prolactin issues.Hopeful.soon a bfp.I only been taking for 3 weeks.